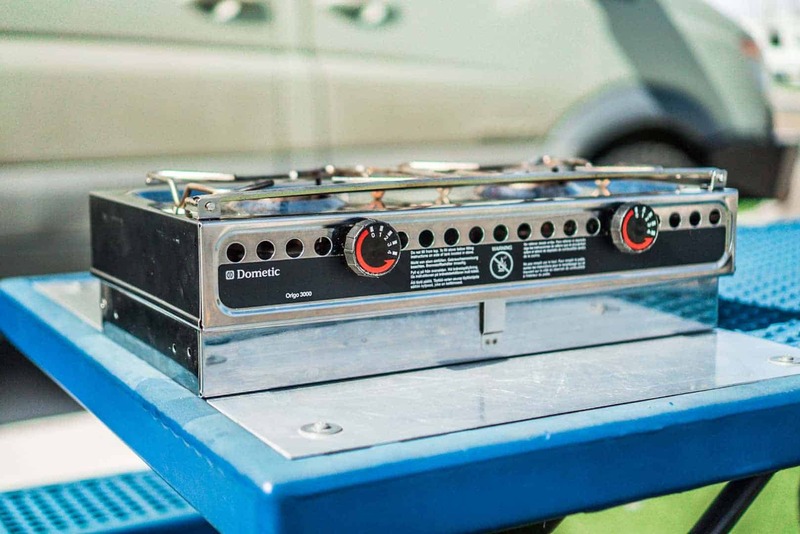 Choosing the right campervan stove for your conversion is a tough decision. When we chose our Dometic Origo 3000 2 burner alcohol stove, there were several considerations for us. After using this alcohol stove for the past 9 months, we’ve found a few things we love and hate about it. The biggest consideration for us when looking at different options for campervan stoves was space. Counter space is at a premium in a van, so we didn’t want to take up a lot of space with a stove like a drop-in stove. After tons of research online and considering the options available, we decided to go with the Dometic Origo 3000 2-Burner Alcohol Stove. 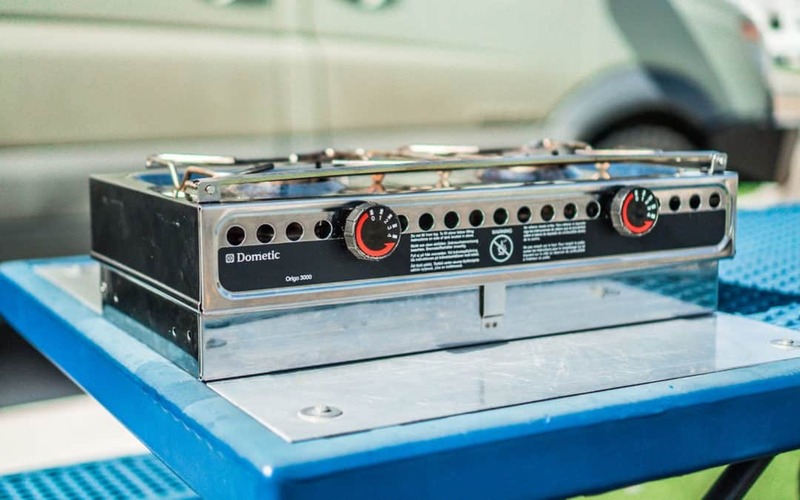 This stainless steel, portable alcohol burning stove is our primary cooking method in our van. Check out our complete van tour HERE! There is no fuel gauge: when the fuel is gone, you’re done cooking! It definitely is pricey at about $338 when we purchased ours. They aren’t as readily available in the US, which means that prices are higher. 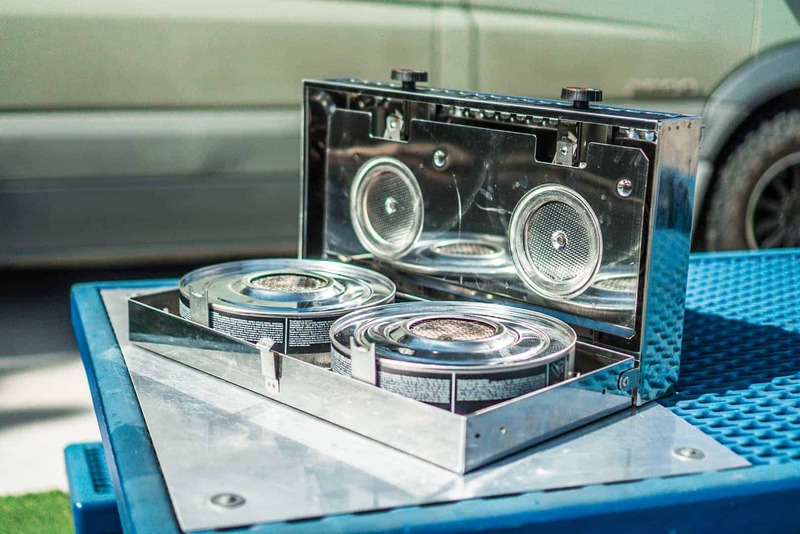 All in all, we’re pretty happy with this campervan stove. The pros outweigh the cons, and I’d rate it about a 7.5/10. 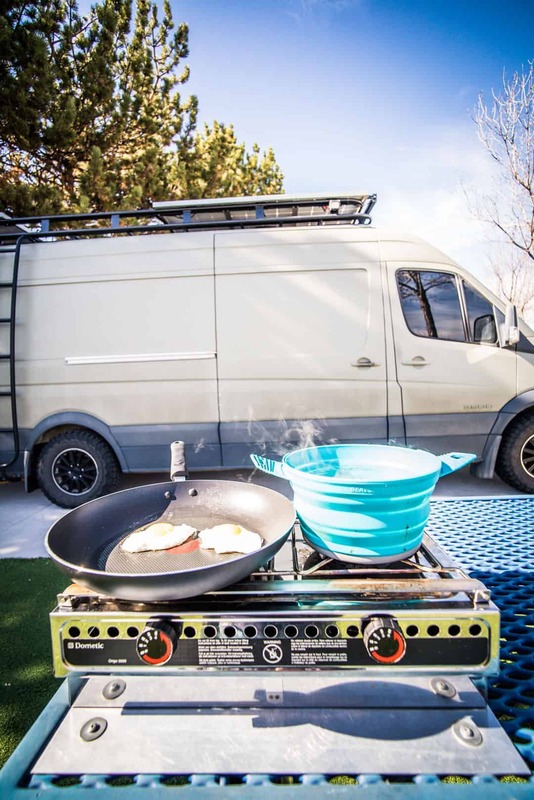 Given the options on the market right now, I’d still purchase this campervan stove over others. I did a poll in a van group in NEw Zealand asking what cooker people recommended. 24 fixed gas hob, 3 butane portable, 2 portable gas cooker, and just one recommended alcohol. Despite that I think its best for me and have ordered one. I heard a whisper that Dometic had discontinued the Origo range, they confirmed this due to low demand. What are your thoughts on that? I don’t really have any ‘thoughts’ on it. A premium price mixed with a lack of marketing on a product will lead to low demand and if there is no demand, it makes no sense to continue to make the product. It’s still a good stove and will be a good stove in 50 years, Dometic is just putting more money into marketing their refrigerators and air conditioners than they are their marine stoves.